Natural bedding breathes, allowing you a deeper, more restful sleep. Offer yourself a 100% natural and comfortable night now! Quality and craftmanship that, since 1835, has been convincing to generations in-store - today available online for the connaisseur. Our craftmanship and tradition guarantees your satisfaction - and you'll be surprised how good natural fiber products feel in bed, like they always did and always will. Your satisfaction is important to us. That's why we suggest you try our online store products for one entire night upon their arrival at your home. If they don't meet with your complete satisfaction, return them for a full product refund (less shipping and handling). We wouldn't have it any other way. Let us know on aftersales@janrom.com. For further terms and conditions, go to: terms and conditions. Comforters, covers, top mattresses, feather beds & pillows are currently taking approximately 3 weeks to make if they are not already in stock - plus 5 to 7 business days to arrive -at your's. 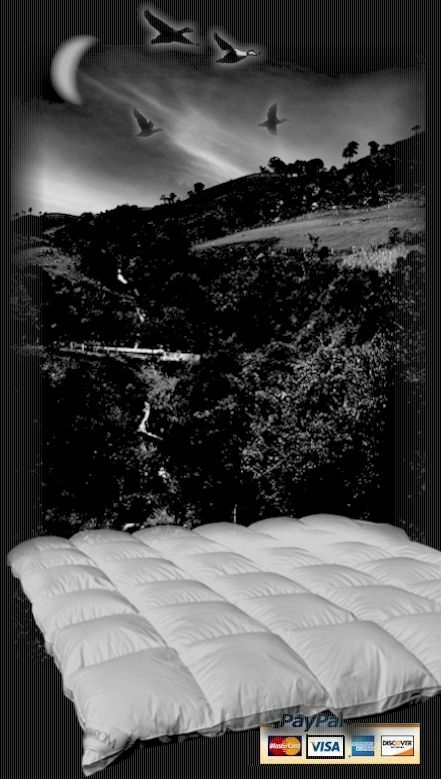 At ROM bedding, providing the very best quality products for a great night's sleep has been our goal for many time. We've worked hard to make sure that our down comforters, down and feather pillows, and feather beds give you the highest level of long-lasting support and comfort. Our linens, duvet covers and blankets can help you create the perfect look and feel for your bedroom. If you have question about the care of your product please read Product Care or you can email to aftersales@janrom.com if it is a more specific matter. We are always looking for ways to improve our products. Over the years, your comments and suggestions have inspired us to choose industry-leading products and technologies and the very best filling materials of all regions over the world. So help us to improve further by mailing to aftersales@janrom.com.